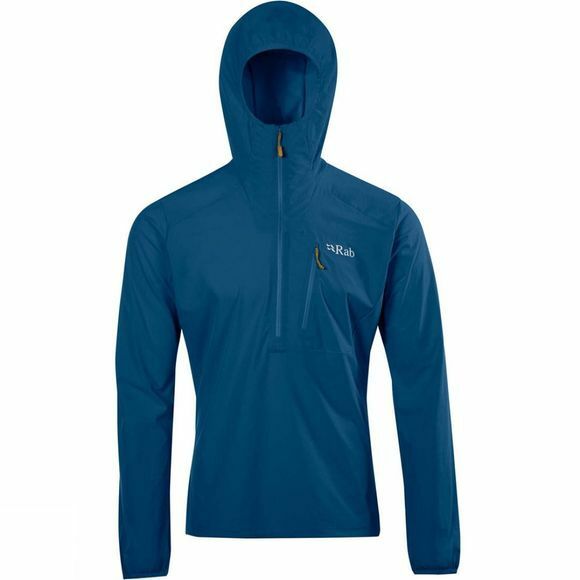 The Mens Borealis Pull-On Top from Rab is a light-weight matrix softshell pull-on, combining wind resistance, high breathability and a small packsize. Ideal for active use in varied conditions. Rab Carrington built his company on two things: A deep understanding of what climbers and mountaineers need, and a commitment to practical gear that works. Throughout much of the 1970’s Rab could be found on ground breaking expeditions around the world. From winter climbing in Scotland and the alps, to expeditions in the Himalaya, Rab gained first-hand experience and understanding what climbers need from their kit. In 1981 the native Scotsman moved to Sheffield to set up Rab. By first deciding how gear should be used, then designing for that use, Rab was able to produce specialist down sleeping bags and jackets with fresh dimension suitable for high performance mountaineering gear, offering products better than any other available at the time. Jump ahead over 25 years and Rab are still at the forefront of innovation and performance. From their super lightweight bivi bags to tough, waterproof and breathable eVent™ jackets, Rab have created some of the most hardwearing and specialist kit in the world. Rab are still to this day designed and produced within the UK, using the highest quality, lightweight materials to create award winning products; and are ceaselessly committed to Rab’s exacting standards, ingenuity and pioneering spirit.